Here you can find every person mentioned by name in the Bible. The list contains 3087 people with details such as who were their parents, brothers, sisters, spouses, concubines and children. Click here to see every relative of king David for instance. Click here for an in depth study of the Family Tree of Jesus Christ. 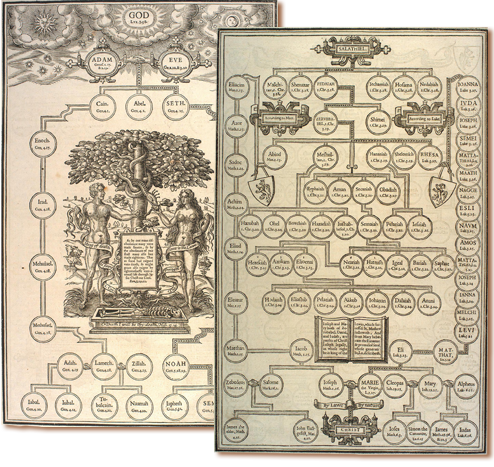 The most interesting feature is the Interactive Graphical Family Tree, showing the ancestors and their relatives of Jesus Christ as they were mentioned in the Bible. Click on the family tree icon to see the family tree of Jesus Christ. There is a cross-reference for each person, listing every Bible verse where the person is mentioned by name. Click here for a page that shows every Bible verse in which Jesus Christ is mentioned by name. Click here for an in depth study of the Kings of Judah and Israel. See how the time-line of each king of Judah compares to the time-line of the Kings of Israel. You can read the whole King James Version Bible here, highlighting and linking every person's name to his or her detailed information page. While you are reading, just click on the name of any person and you'll see all of his/her relatives in the next page. Click here to read the 1769 Oxford Edition of the King James Bible. Have you met Jesus in person? It is my sincere wish for everybody to get to know Him. Not as a distant historical figure, but as a true friend and only Saviour. Click here for a collection of a few Bible verses that could help you to start a personal relationship with Jesus. Shortly after beginning to read the Bible you may have found it difficult to keep track of all the different names. Perhaps you've tried to write out how everyone is connected, but even before finishing Genesis, found the list had already become far too long. Now however Complete Bible Genealogy provides a list of all the names and relationships, which you can use as a reference or as an addition to your Bible studies so you no longer need to worry about who's who in the Bible. The secondary purpose of this site is to encourage those who hesitate to read the Bible because of the many names. Our hope is to help people overcome this obstacle and help them to make it easier to start reading God's word. Which Bible version is used as the basis of this site? "Authorized King James Version, edited by Dr. Blayney of Oxford (1769)". One of the most important parts of this project is to define what source would be used. There are many Bible translations available for us today and people's opinions are widely divided regarding which Bible is more accurate, which is easier to read, which provides better study tools, etc. You may ask, "why is it necessary to have so many versions of the Bible?". The answer emerges when you start to compare the different translations. The translators stay as close to the original version as possible while making sure that the translation will be readable enough for their audience. For greater accuracy these translations can be used for reference works. It is up to the reader how they interpret the verses: the translators don't try to change the wording in order to express their specific theological views, they present the thoughts as they were originally written. The translators focus mainly on preserving the meaning of the verses and they use greater freedom selecting the words and phrases, therefore the finished translation is less usable for reference works, but more readable for wider audiences. The logical choice was to use the King James Version, as it is a word-for-word translation, it has been around since 1611 and it is probably still the most widely used English translation. Characteristics of the Authorized KJV Bible, 1769 Oxford edition page. The electronic text of the Bible used here was obtained from The Oxford Text Archive (http://ota.ahds.ac.uk ) and analyzed using F.H.A. Scrivener's book "The authorized edition of the English Bible (1611), Its Subsequent Reprints and Modern Representatives" (ISBN 1-59244-634-5) in order to pinpoint the exact edition. Once the electronic text was in place we wanted to find an in-print Bible, which used the same text. 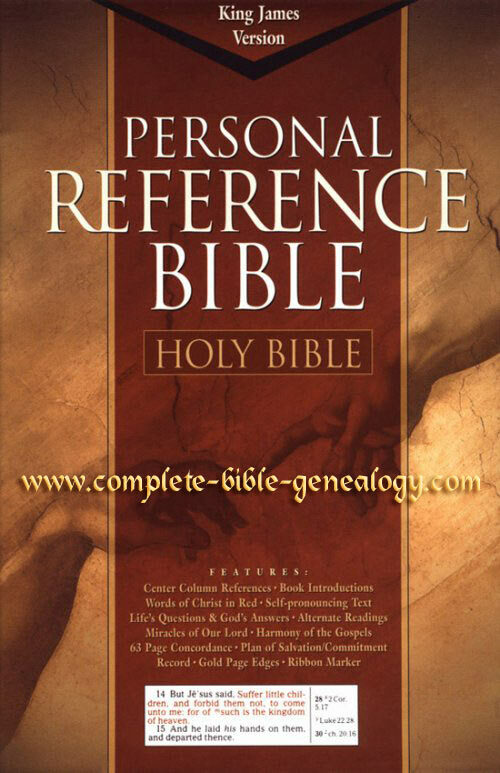 The closest match was: Cornerstone Bible Publishers - "Personal Reference Bible, King James Version". If you would like to use complete-bible-genealogy.com on your computer without being connected to the internet, then you can download it here. Please enter your email address below and you will receive an email with information, how to download the website. Below is an advertisement that is not necessarily expresses the views of Complete-Bible-Genealogy.com. It is here to offset the cost of operating this website. 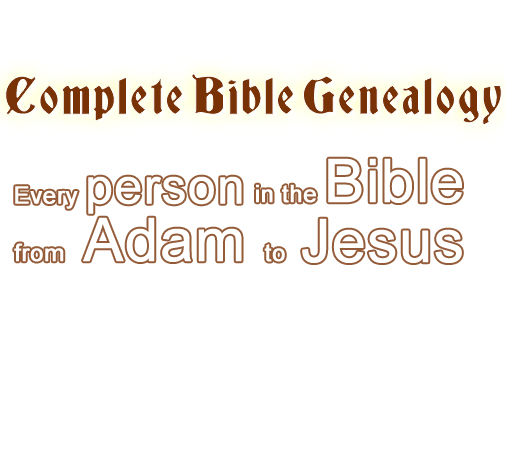 Copyright © 2005- complete-bible-genealogy.com - All rights reserved.